Lectins are proteins commonly found In foods of high nutritional value. Typically, lectins interact with glycoprotein, glycolipid or oligosaccharide residues on the cell surface, causing a variety of effects including: blastogenesis (rapid cell reproduction), agglutination and receptor agonism. The mucin-rich gut wall is especially prone to direct reactions with lectin-containing foods in the diet. Lectins (from the Latin legate, to pick or choose) were first identified in 1888 by Stillmark at the University of Dorpat in Estonia. While investigating the toxic effects on blood of castor bean extract (Ricinus communis) he noticed that the red cells were being agglutinated. He isolated the material responsible for the agglutination and called it ricin. Shortly afterward at the same university Helfin discovered that the toxic extract of the seed Abrus precatoris also caused cells to clump together. This new agglutinin was called abrin. This immediately caught the attention of the German bacteriologist Ehrlich who recognized that he could investigate certain immunologic problems with them rather than the then popular bacterial toxins. With these two agglutinins some of the most basic principles of immunology were discovered, such as antibody specificity and species specificity. In 1908 Landsteiner reported that small amounts of lentil lectin would agglutinate rabbit erythrocytes, even high concentrations of the lectin had no effect on pigeon red cells. The first lectin to be purified was concanavallin-A, isolated from the jack bean. In 1936 Sumner and Howell noted that the addition of Con-A to a solution of glycogen caused the sugar to precipitate, and that the agglutination of red cells by this lectin was inhibited by cane sugar. They suggested that the hemagglutination by Con-A might be the consequence of a reaction between the protein with carbohydrates on the surface of the red cells. In other words lectins bind sugars, and they agglutinate cells by means of this binding. For example the agglutination of red cells by Con-A specifically inhibited by the sugars mannose or glucose, Indicating that Con-A binds mannose and glucose on the cell surface. It was soon discovered that lectins not only agglutinate red blood cells, but also other kinds of cells including lymphocytes, spermatozoa, bacteria and fungii. Carbohydrates are the most abundant group of biological compound on the earth, yet comprise only about 1 percent of the human body. Nevertheless approximately 50% of the dietary caloric intake is in the form of carbohydrate. Structural carbohydrates are usually glycoconjugates such as glycoproteins and glycolipids. Monosaccharides rarely exist free as such in nature. Typically they exist in giant molecules called polysaccharides that can consist of up to 26,000 monosaccharides. Sugars also appear frequently as oligosaccharides made up of from 2 to 10 monosaccharides. Until recently, it was not recognized that nature could employ sugars for the synthesis of highly specific compounds that can act as carriers of biologic information. Monosaccharides can serve as "letters" in a vocabulary of biologic specificity, where the words are formed by variations In the nature of the sugars present, the type of linkage, and the presence or absence of branch points. The first proof that sugars could serve as specificity determinants came from the discovery that influenza virus could agglutinate red cells only In the presence of the membrane bound sialic acids. It these were removed, the virus no longer binds to the cell. Removal of sialic acid exposes the terminal underlying galactose unit and results in the rapid clearance of the treated cells from the bloodstream. Sugars on cell surfaces also seem to determine the distribution of the circulating cells within the body. Radioactively treated rat lymphocytes will migrate to the spleen when re-injected into the animal. However if the sugar fucose is removed from the surface of the cells before reintroduction, the cells migrated to the liver instead, as if "the fucose served as a ZIP code- directing the calls where to go." It was not until 1953 that Morgan and Watkins demonstrated that the specificity of the ABO blood group-system was determined by sugars. For example, the difference between blood types A and B lies in a simple sugar unit that sticks out from the end of a carbohydrate chain of a glycoprotein or glycolipid. In blood A the determinant is acetylgalactosamine and in group B it is galactose. Several toxins of bacteria and plants are known to recognize carbohydrate structures present in various classes of cell surface molecules. When a lectin contains multiple binding sites, they can interconnect large numbers of cells, causing them to clump together or agglutinate. Each molecule of a lectin has two or more regions, perhaps clefts or grooves, each of which fits a complementary molecule of a sugar or several sugar units of an oligosaccharide. It is by means of these combining sites that the lectin attaches itself to the sugars on cell surfaces. Specificity for human blood groups Blood typing; structural studies of blood group substances; identification of new blood types; diagnosis of secretors. Induction of mitosis in lymphocytes Studies of chromosomal constitution of cells. Agglutination of malignant cells Investigation of architecture of cell surfaces. >Table 1. Properties and uses of lectins. The binding of lectins to sugar is quite weak. It does not form a covalent bond, but is reversible, like enzyme-substrate or antigen-antibody reactions. Lectin-sugar reactions actually share many factors in common with antigen-antibody reactions, especially precipitation, which has prompted several investigators to suggest that lectins are plant antibodies. However this has been tempered by several major differences between the two. Antibodies are made by higher organisms which have specific immunologic organs. Lectins are present as constituent proteins. Second, antibodies are all structurally similar to one another, whereas lectins are structurally diverse; examination of the amino acid sequence, molecular size and other molecular properties show that lectins have little in common other than they are all proteins. For example soybean agglutinin is a glycoprotein with no di-sulphide bond; its molecular weight is 120,000, It consists of four subunits and has two binding sites. Wheat germ agglutinin is not a glycoprotein and is rich in di-sulphide bonds with a molecular weight of 36,000, It has two identical subunits and four binding sites for sugars. Lectins are apparently most widely distributed in plants, where they were found in almost 1000 plants of some 3000 examined in recent years. They are particularly abundant in legumes and they account for between 1.5 and 3 percent of the total protein content of soy and jack beans. The second most common source of lectins are seafood. Although many lectins are destroyed by normal cooking (which is why grains and beans are edible), many are not. Relative resistance to lectins was pan of the classic description of wheat germ agglutinin (WGA) made by Aub in 1963. WGA as Freed points out is in fact one of the more heat sensitive lectins, being destroyed after 15 minutes at 75 degrees C, whereas other wheat lectins in gluten and gliandin resist autoclaving at 110 degrees C for 30 minutes. Gibbons and Dankers noted that in over 100 food plants found to contain active lectins, seven were autoclave resistant (apple, carrot, wheat bran, canned corn, pumpkin seeds, banana and wheat flour). Nachbar and Oppenheim also noted high levels of lectin activity in dry roasted peanuts, Corn Flakes, Rice Krispies, and Kellogg's Special K. The banana agglutinin was actually enhanced by heating, and was inhibitable by n-acetyl glucosamine (NAG) and N-acetylgalactosamine (blood group A antigen) glycoproteins. Phytohemagglutinins from kidney beans can resist mild cooking and retain lectin activity even at 90 degrees C for 3 hours. Pre-soaking the beans however resulted in complete loss of lectin activity. Several investigators noted year-to-year and batch-to-batch variations in the lectin content of foods, so the occasional lectin is likely to occur even with foods normally considered safe. It has recently been shown that Con-A causes a greatly enhanced secretion of mucous from the intestines of laboratory rats. It has been suggested that this "mucotractive" effect of lectins may have some usefulness in cystic fibrosis. DJ Freed ingested a 10mg dose of Con-A in tap water. Later that day and on the next day he experienced moderate by quite intrusive bowel colic, with passage of foul smelling flatus of unfamiliar odor, and on day three passed a stool of normal size and texture, but thickly coated with mucous. Brady gave purified WGA to human volunteers and recovered about 2% from the feces. It was speculated that the lectin escaped digestion by binding to the dietary fiber, and noted that a high fiber diet is also, by and large, a high lectin diet. Lectins which are especially rich in di-sulphide bonds such as WGA are very resistant to proteolytic enzymes, detergents, urea, alkalis and acids. Foodstuffs are naturally rich in fiber Important cause of allergies. Dietary lectins also stimulate mast cells which can degranulate and release stored histamine, leading several researchers to ascribe a role for dietary lectins in the genesis of food allergy. However it is not generally known why some individuals become sensitized to food in their diets. In an attempt to clarify this, coeliac disease has been extensively studied, since patients with this disease usually normalize when placed on a gluten free diet. Researchers reported that the mucous membranes of coeliac patients showed sugar residues which were capable of binding to the lectins in wheat germ, which resulted In a cytoxic reaction. Rats treated with Concavallin-A or wheat germ lectin developed a gut membrane that was paradoxically impermeable to small molecules, but very permeable to large, highly allergenic molecules, a situation which is mimicked in food allergies and coeliac disease. A component of wheat gliandin has been shown to bind preferentially to crypt epithelial cells of coeliac disease subjects, but only rarely in health volunteers. This seems to result from an Immaturity in the pattern of call surface carbohydrates on the coeliac enterocytes, perhaps, as Kottgen speculates, due to a genetically determined deficiency of a growth dependent enzyme, N-acetyl-glucoaminyltransferase, which renders coeliac patients sensitive to the effects of the oligomannosyl-specific lectin gluten. Mannosyl oligosaccharides have been tried clinically, with mixed results. Several investigators have noted a syndrome that is indistinguishable from coeliac disease that is produced by soy beans. Investigators have also described a patient with soya intolerance whose severe diarrhea was ameliorated by ingesting sugar inhibitors of soybean agglutinin (SBA) such as galactose or lactose, whereas glucose or sucrose made it worse. Ament and Rubin noted violent reaction to soy protein formula in a 6-week-old infant. The infant developed (sequentially) fever, leukocytosis, cyanosis, vomiting, massive blood tinged mucousal diarrhea, dehydration and acidosis. All symptoms disappear after discontinuing soy milk. The jejunal mucosa, previously normal, became inflamed and flat with the disappearance of the intestinal villi; however it had regenerated by the forth day after discontinuance. PNA has an extraordinary preference for gastrin secreting cells as opposed to other stomach cells. WGA binds to microvilli in the intestinal crypts and to the goblet cells with an affinity which increases from the proximal to distal intestine. Lectins in the small intestine appear to encourage bacterial overgrowth. Lectin damaged areas of the jejunum have been observed to be characteristically heavily infected with coliform bacteria. It Is worth noting that most human microbial pathogens and parasites are able to overcome normal gut motility by lectin-like attachments of lectin like activity. Forsdyke has hypothesized that those ingested lectins that are cytotoxic (via alternative complement activation) are likely to damage first the lymphocytes of the mesenteric nodes, thus making more likely bacterial overgrowth and eventual food allergy. Jaffe classifies lectins under Type 4 Cell Activation Lectin/ Cytokine Interactions." Various lectins have been shown to bind to IgE receptors, including pea, WGA, peanut agglutinin (PNA) and Con-A. WGA has been shown to stimulate histamine secretion from non sensitized rat mast cells in vivo, In the absence of extracellular calcium. This is in accordance with other observers who noted a bacterial lectin-like reaction in the lungs of intrinsic asthma sufferers attributed to a defective pulmonary barrier which would allow bacterial lectins to interact with the basophil cell surface and induce degranulation and histamine secretion. Nachbar tested 88 common food items and reported erythrocyte agglutination activity in 38. Many foods showed agglutinating activity so substantial that the extracts could be diluted several fold. Crude extracts of various foods tomato, lettuce, cucumber, wheat bran and whole wheat, sesame and sunflower seeds, vanilla yogurt, coconut, banana and baby food banana, carrot, onion, apple, alfalfa and soya protein have also been found to bind, and in some instances precipitate the components of human saliva, including cellular debris and bacteria. This may have some significance in the development of caries. Interestingly, avocadoe lectin inhibited the sucrose dependent adherance of S. mutans to plaque pellicle. Approximately 1 to 5% of the ingested dietary lectins are absorbed into the blood stream. Here they can clump and bind to red and black blood cells, destroying them. It has been proposed that much of the low grade anemias seen In the third world may be resulting from destruction of red blood cells by lectin rich grain and bean diets. Both human and animal kidney contain abundant structural glycoproteins that offer binding sites for various lectins. WGA binds to the glomerular capillary wall in man, in addition to the inner surfaces of the collecting ducts. Many dietary lectins, including WGA, lentil (LCL) and green pea (Pisum sativum) lectin (PSA) can bind to human insulin receptors and mimic insulin. WGA Is as effective In molar terms as is insulin at enhancing glucose oxidation and has been shown to enhance the affinity of insulin Itself for its receptors. This low dose insulin-facilitating effect was also observed for LCA. Many workers have taken note of the differing glycemic effects observed with various carbohydrates. Diabetes are often prescribed a high fiber diet Including the use of pectins. The difficulty with the mimicking of hormones by dietary lectins is that they lack the normal feedback and metabolic degradation controls. Insulin mimicking lectins produce more persistent effects than insulin, resulting in greater deposition of fat and inhibition of lipolysis. Human myelin has a strong affinity for ConA, WGA, PHA and LCA, as do nicotinic acetylcholine receptors of the rat brain. Russian studies noted a subnormal lymphocyte response to PHA and Con-A in schizophrenics. Lectins have been shown to bind to human syncythial trophoblasts, to inhibit the binding of nerve regrowth factor to fibroblasts and to bind follicle stimulating hormone. Multiple interactions with normal plasma enzymes, glycoproteins and immunoglobulins have been observed. The Thomson-Friedenreich antigen (T-antigen) is generally not found on human cells, but can be exposed after the sialic acid molecule have been removed by the action of neuramidlase. This can commonly occur since all Pneumococci, most strains of influenza, Vibrio cholerae and Clostridium all contain active neuramididase. Antibodies against T antigen are found in humans after the first few months of life. Peanut agglutinin is specific for it. After neuramidase exposure, PNA binding sites for T-antigen can be found on lymphocytes, erythrocytes, breast epithelial cells, glomeruli, milk-fat globule membranes and thrombocytes, serum glycoproteins. Hemolytic-uremic syndromes following pneumoccocal infection, presumably an attack by anti-T antibodies, could possibly result from T-specific lectins. It also interesting to ponder the observation of several investigators who have noticed that many cases of food intolerance develop after influenza. Bacteria typically attach to prospective host cell membranes via receptors with lectin- like sugar specificity. This is of great importance, as the adherence of bacteria to host tissue surfaces is the initial event in a bacterial infection. Salmonella and Escherichia coli both carry several surface lectins with pronounced immunosuppressive ability. Both adhere to epithelial cells through units of mannose on the cell surface. Colonization of the urinary tract with E. Coli can markedly be reduced by the administration of mannose sugars. Inhibition of bacterial adherence to bladder cells has been thought to account for the beneficial effects of cranberry juice. Cranberry juice cocktail inhibited the adherence of urinary isolates of E. Coli expressing type 1 fimbriae (mannose specific) and P fimbrae (specific for apha-d-gal-[1-4] beta-d-gal). Pineapple juice inhibited type 1 but not P type fimbrae. Lectins on type 2 fimbriae, which recognized galactose receptors on lymphocytes, play a crucial role in the phagocytcsis of several Actinomyces spp. Irritation of the gut mucosal tract by Salmonella lectin may be as important in the production of the symptoms of food poisoning as the salmonella food toxin itself. In sensitive individuals, lectins in the diet can bind to the intestinal walls, causing severe lesions, inflammation and swelling. Neiserria gonnorhea, the bacteria which causes the venereal disease gonorrhea, Is unique in that it is the only member of its family that is pathologic and the only member that is agglutinated by wheat germ agglutinin. Several lectins have been shown to possess agglutination properties against bacterial strains. Staphylococcus aureas and mutans has been extensively studied, These have been shown to be agglutinated by several commonly available lectins- including tomato, cantaloupe and wheat. The author has employed tomato lectin in clinical practice by way of topical applications of raw tomatoes to the eyes in staphylococcal conjunctivitis with very satisfactory results. Lectins have been shown to inhibit the release of Myxovirus and Newcastle Disease virus from infected cells. In 1960 Nowell added PHA to a blood sample to agglutinate erythrocytes and thus encourage their removal and noticed to his annoyance that the lymphocytes had also been affected. He had discovered the mitogenic effect of PHA (and many other lectins) which was to be the key to the explosion of knowledge about lymphocyte physiology. Lectins are probably the best biologic response modifiers (outside of monoclonal antibodies) found in nature. Hemagglutinating properties are not necessary for a lectin to possess mitogenic activity. Many mitogens are "lectins" only if we enlarge the category to include monovalent molecules with high carbohydrate affinity. Paradoxically, any plant polysaccharides can be thought of as "reverse lectins" i.e. their sugars bind lectin-like receptors on the call. This has been demonstrated for polysaccharides isolated from Thuja occidentales, which show high mitogenic activity that is blocked by anti-interleukin I antibodies, This proves that plant polysaccharides are definite biologic response modifiers. Other polysaccharides from higher plants such as Baptisia tinctoralis (heteroglycans) or Angefica acutiloba ("Angelica immunostimulating polysaccharide") and the fungii Basidlomycetes (lentinen, schizophylan, pachymaran and krestins) have also shown mitogenic and respose modifying activity. How mitogens work is still imperfectly understood. Con-A has been shown to induce microtubule assembly in polymorphonuclear leukocytes. Lectins have been shown to cause early changes in cytoplasmic free Ca2+ and influence the lymphocyte membrane potential. Both Con-A and PHA were studied as to their effect on lymphocyte glycosyltransferase activty. The investigators found that this enzyme, associated with increased transport activity of sialic acids, galactose and NAG was stimulated by Con-A but not by PHA. Thus the mitogenic effects of lectins on lymphocytes is not constant. Lymphocytes in mitosis are almost never found in peripheral blood, but they were observed frequently in the blood smears of children who has eaten the North American shrub called pokeweed (Phytolacca amer.) Pokeweed mitogen is one of the few lectins that stimulates B lymphocytes as well as T lymphocytes. In vitro it triggers the production of IgE as well as other antibody isotypes. The discovery that grass pollen apparently share a common lectin perhaps offers a clue as to why pollen so often provoke allergy. Lymphoid cells from patients with chronic lymphatic leukemia bind less PHA than do normal cells, and react poorly to the mitogenic activity of this and other lectins. B lymphocytes stimulated by lectins are capable of synthesizing antibodies; T- lymphocytes may be turned into "killer cells" that destroy any foreign cells that they contact. Many subpopulations of lymphocytes are specifically stimulated by particular lectins. Separating mouse thymocyte populations into two groups, one that was agglutinated by peanut lectin and one that is not. The thymocyte population found to not be agglutinated by the lectin was found to resemble the adult circulating lymphocytes. Only this population of thymic lymphocytes has a high sialic acid content on its membrane, leading researchers to speculate that the attachment of sialic acid to the lymphocyte surface was a crucial maturation step. Since blastogenesis can also occur in suppressor -T cell populations, it is quite feasible that significant suppression of graft versus host responses in tissue transplants can be accomplished by the use of lectins. Significant studies are now under way at Stanford University showing that lectins can be used exclusively to maintain transplants in animals for up to two years. Lentil lectin induces striking transplant tolerance In both mice and humans. Peanut agglutinin has been used to isolate suppressor T-cells in vivo, these having been first Induced by Con-A. Tomato lectin has been shown to inhibit the transformation of peripheral lymphocytes challenged by recall antigens, and actually suppressed spontaneous DNA synthesis. The inhibition of lymphocyte transformation was not stopped by exogenously added Interleukin 1 and/or Interleukin 2, even at extremely high concentrations. This could be significant as the average American diet results in the ingestion of at least 200 mg. of tomato lectin annually, with vegetarians probably ingesting a far greater amount. PHA has been shown to suppress experimental autolmmune thyroiditis in mice for up to 7 week. Electrolectin from the electric eel (Electrophorus electricus) was shown to prevent and effectively treat experimental auto-immune myastenia gravis in rabbits, considered a good model for the human disease myastenia gravis. Administration of electrolectin to the afflicted rabbits lead in all cases to complete recovery, presumably through modulation of the suppressor cell activity directed against acetylcholine receptor protein self antibodies. Chinese bitter melon lectin (Mornordica charantia) has been shown to possess potent immunomodulatory activity. "Locoweed" and several species of Astragalus and Oxytropis, when fed to yearling ewes, resulted in a gradual decrease in total leukocyte and peripheral lymphocyte blood levels. The lectin most studied in humans as regards to mitogenic effects is pokeweed mitogen (PWM), isolated from Phytolacca arriericana. Phytolacca lectin is one of the rare lectins which is mitogenic for both T and B lymphocytes. Recent studies on the plant show that salt water extracts of the plant yield five separate lectins, designated Pa-l through Pa-5. Pa-1 seems to be the only heamagglutinating lectin, and is powerfully mitogenic. Pa-2 and Pa-4 are the predominant mitogens in the roots. Pa-1 is mitogenic for both B and T cells, while the other four lectins are only mitogenic for T cells. Interestingly, PWM blastogenesis is inhibited by other lectins such as WGA. Benincasa cerifera, used in Sino-chinese medicine as an antinflamatory diuretic, was shown to contain a powerful anti-tumor mitogen termed "B. cerifora mitogen" (BCM). Salt water extracts of the seed were shown to contain B cell mitogenic, adjuvant active and antitumor active substances. Wheat germ agglutinin (WGA) induces proliferation of T-cell colony forming units and growth factor production. PHA can induce the acquisition of T cell surface markers in peripheral blood in the absence of the normal maturation controls of the thymus. Other studies showed that this occurred only in high IL-1 environments. This was shown to be produced by "mitogen induced erythroid burst promotion" due to monocyte blastogenesis produced by Con-A. Interestingly PWM did the exact opposite (suppressed erythroid burst activity), which could account for the anti-inflamatory activity traditional ascribed to the plant. Human peripheral blood lymphocytes precultured with lipopolysaccharide from E.Coli (LPS) were shown to have a greatly enhanced blastogenic response when pokeweed mitogen was added to the suspension. Injections of lentil lectin into the knee joint cavity of non-sensitized rabbits resulted in the development of arthritis which was indistinguishable morphologically from rheumatoid. In a rather perverse way "negative-blastogenesis" can also be produced by using appropriate sugar molecules to "suppress the suppressors". Several sugars have been shown to selectively do this including mannose and fucose. Lectin Induced blastogenesis may have some impact In the myeloproliferative disorders. Hodgkin disease cells have been shown to elaborate an agglutinating lectin on their surfaces. No other property of lectins has attracted as much attention as their ability to agglutinate malignant cells. This was discovered by chance at Massachusetts General Hospital by Joseph C. Aub in 1963. Aub believed that the difference between cancer cells and normal cells lay on their surfaces; and that alterations in the properties of the cell surface enabled cancer cells to multiply when normal cells would not, detach from their primary site and spread throughout the body. At the time the idea seemed quite strange, and as Nathan Sharon, in his review article on lectins In Scientific American, put it: "bordered on lunacy". Aub worked with several enzymes, trying to determine whether the surface of a malignant cell was different from that of a normal cell. Only in the case of one enzyme, a lipase from wheat germ, did he observe a difference. Normal cells did not seem to be affected, but malignant cells were agglutinated. When he replace the wheat germ lipase with a pancreatic lipase, however no agglutination took place. Aub also found that the enzyme activity of the wheat germ could be destroyed by heating, but the agglutination took place all the same. Aub and his colleagues then discovered that the wheat germ lipase contained as a contaminant a small protein that was responsible from the agglutinating activity. Burger and Goldmanberg suggested that the surface of malignantly transformed cells contained a component which was not found on the surface of normal cells. It was proposed that this component is NAG or a closely related derivative since ovomucoid, a glycoprotein rich in NAGs inhibited the agglutination at very low concentrations. A higher local density of lectin binding sites have been observed in addition to an interesting phenomenon called "capping" where lectins begin to cross link more and more surface receptors which result in more and more binding sites becoming available for cross linking. This eventual tends to cluster the binding sites to one side of the cell, producing a "cap" which can be observed by radio identification. This apparently results from a transmembrane effect involving a glycoprotein, spectrin, which aggregates upon contact with a lectin. This discovery began a now era in lectin research. Soon it was found that Con-A also agglutinated malignant cells. Recently the Weizmann Institute of Science in Israel found that soybean agglutinin also possesses the same property. As a rule malignant cells are agglutinated by very low concentrations of a particular lectin and normal cells are not agglutinated unless the concentration is many times higher. The higher proportion of malignant cells agglutinated probably results from the sizeable increase in surface receptors on the malignant cells, which probably results from their incredibly high reproduction rate. PNA has been shown to inhibit the growth of several breast cancer cell lines, In addition to allowing for the destruction of breast cancer cell In harvested bone marrow with a highly effective and selective (3 or 4 log depending on the cell type) action. It has been speculated that the production of wheat germ agglutinin protects the young swelling seed from fungii and other chitin containing organisms. It is interesting to speculate on the traditional effectiveness of wheat grass preparations in certain malignancies, in light of the high lectin content within the seed at the time of preparation. In addition, perhaps it is the heavy use of soy products found in macrobiotic cookery (and the concurrent high intake of soybean lectin) which has resulted in the many positive responses to cancer ascribed to this form of diet. While plant-based foods often provide great nutritional value, they are never more potent than when they first sprout. Dr. Peter D'Adamo realized the potential of these young, sprouted plants and has included them in unique blends for each blood type. 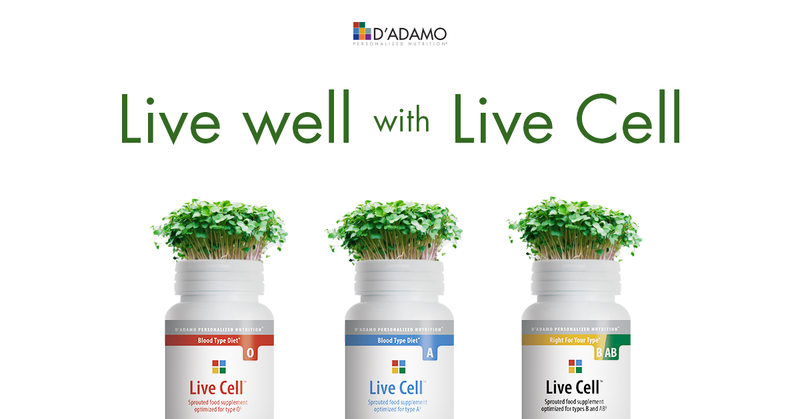 Live Cell will promote your immune system health and body detoxification all while providing you with a concentrated dose of natural, plant-based vitamins and minerals.